Curator Juleana Enright brings fresh takes on bodies, borders, and beauty to Gamut Gallery. 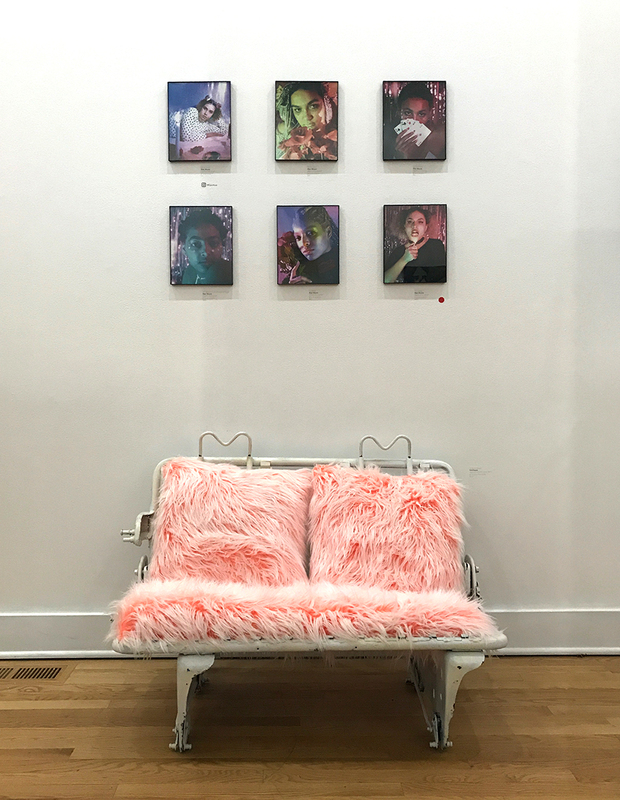 Gamut Gallery’s intimate space is the perfect fit for Soft Boundaries, a show themed around the idea of vulnerability and strengthened by the community of artists assembled by curator Juleana Enright. The works in the show are effortlessly cohesive; they are in conversation with each other, even as they cover topics ranging from the vulnerability of trans bodies to the displacement of the Palestinian people. Upon entering, visitors are immediately invited to touch a mannequin that has been mounted on gatorboard and covered in sequins. Gold sequins flip up to reveal gray backsides as you choose to run your hand over either the figure’s body or the canvas. This piece by Laurie Borggreve, entitled Do Not Touch, sets the tone for the show. Soft Boundaries raises questions about the curating of bodies and people, along with consent and vulnerability on both a personal and political scale. Passing Borggreve’s work and entering the main gallery, it feels like you are walking into someone’s living room. It is clear that the same driving force pulled these works into fruition and placed them in dialogue with one another. This cohesion is due in no small part to the fact that Juleana found most of the participating artists through existing friendships and mutual acquaintances. “I know [these artists] so personally, and know their work and really have a lot of faith and confidence in what they’re doing,” Juleana said. 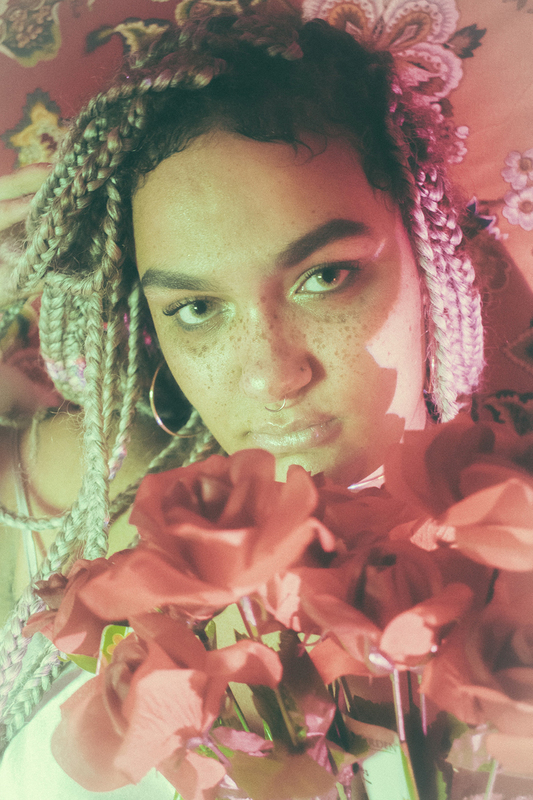 Soft Boundaries is the debut show for nineteen-year old photographer Blair Moore, whose work Juleana stumbled across online. Artist Dom Laba’s photography hangs adjacent to Moore’s. Both Moore’s Wild Child series and Laba’s SFT series portray the experiences of marginalized youth through highly staged photographs, but aesthetically they couldn’t be more different. The idea of curating oneself and one’s environment as an act of vulnerable creation runs throughout the show. Artist Mikki Coleman’s hand-cut collages showcase the ability of people who face gender discrimination to actively shape their own identity, even in the face of external oppression. Through dismantling and reassembling photos of bodies, Coleman expresses gender dysphoria as an act of creating something new and beautiful. When asked what criteria they were looking for in a show about something as broad as vulnerability, Juleana referenced the conversations they had had with each artist before inviting them to be in the show. All of the artists shared a desire to “use softness as a protective force, as a way to heal themselves and to heal others.” These artists express vulnerability through the content of their art, but also seek to affirm it and redefine it, turning it into something potentially powerful while acknowledging the external forces of violence and manipulation. The scale of vulnerability addressed in the works ranges from the personal to the political, and blurs the distinction between the two. Palestinian-American artist Lamia Abukhadra’s prints call attention to the situation in Palestine by expressing the vulnerability of the Palestinian people. 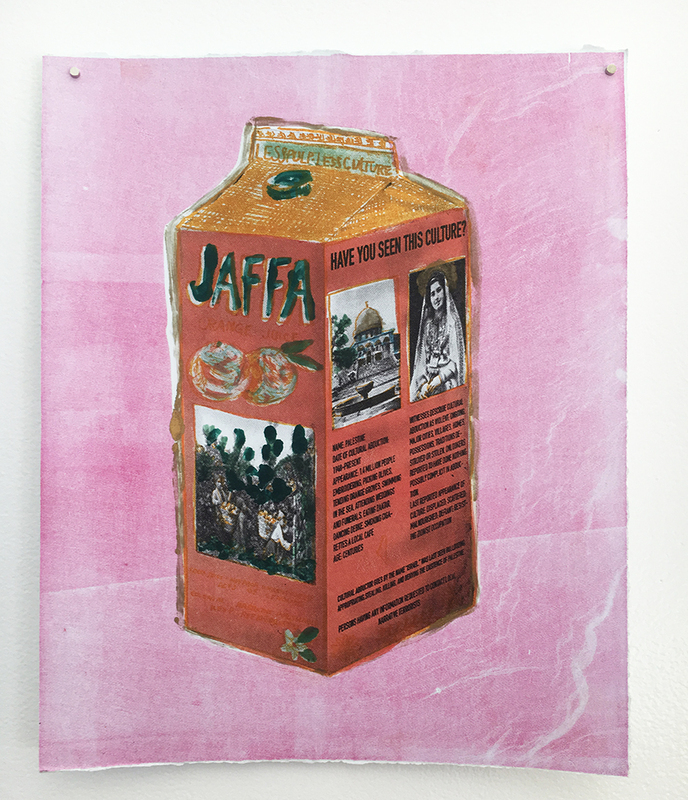 Her series Missing depicts Jaffa orange juice cartons with a missing persons notice on the side. Instead of one person, the whole Palestinian culture is absent as a result of exclusion and opportunistic appropriation by Israeli entities. Perhaps in part because many of the artists are younger, a kind of “Instagram aesthetic” flows through many of the works in the show. 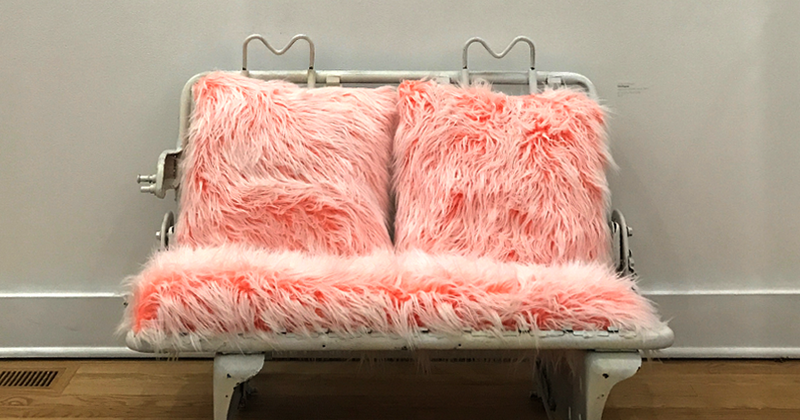 Multimedia artist shhhhame uses millennial pink and an almost naïve style to paint dogs, bottles of Hennessy, and people who have had an impact on her life, even if it was an overwhelmingly negative one. Many of her works are in a square format. Instagram handles are included on all of the artist labels. In keeping with the theme of Soft Boundaries, the vulnerability inherent to posting on social media is represented in the work of Nadia Honary. 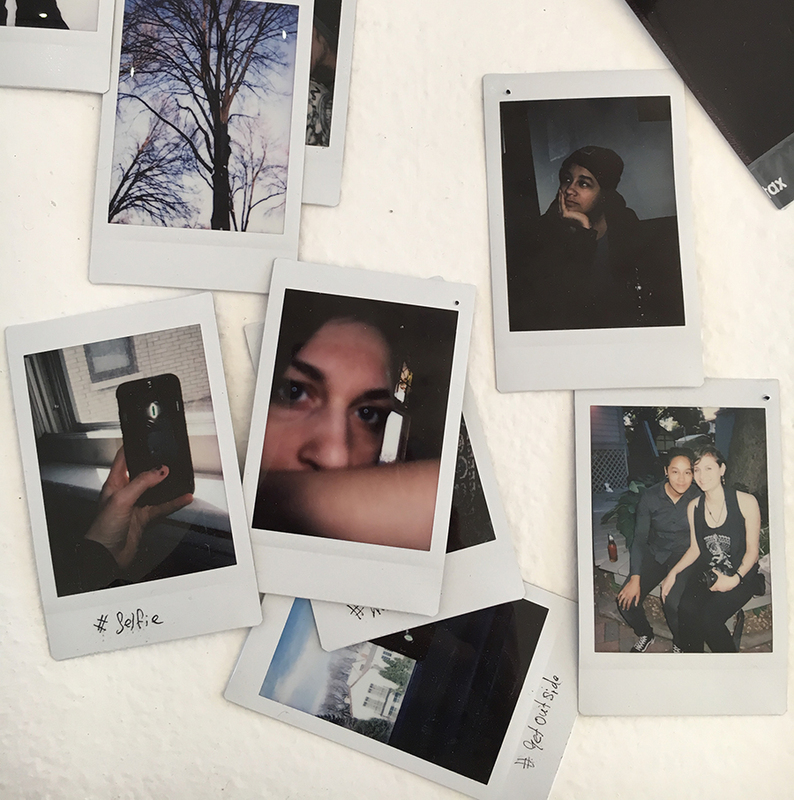 Honary has strewn Polaroids on a podium, many face down, waiting to be flipped over and gone through by visitors. Behind the podium is a TV monitor playing a video of a masked figure carrying out various tasks on a computer. Different posts and photos appear on the screen, interspersed with shots of the masked subject; they are seeing the content without anyone seeing them. One of Juleana’s goals for the show was to create a space for the queer community, for people of color, and for other marginalized artists whose work is most often shown as a token in largely white, cisgender spaces. Juleana hopes people will come in and get to know these artists more. One great opportunity to do so is at an upcoming performance on Thursday, May 3rd. In addition to being able to view the work in a communal setting, patrons will be able to see responsive performance art pieces. Cassie Garner, Gamut’s gallery director, frames this performance night as a sort of happening. Garner promises “full captivation of the room” by A M O D E L, a duo consisting of performance artists Sonja Elise Johanson and Cole Mealey. Johanson has performed at the gallery in the past, using her silent theatrics to engage audiences with the space and with each other. The night will also feature burlesque-inspired performance artist Marcel Michelle-Mobama, whose style is very different from that of Johanson. Juleana says that in Michelle-Mobama’s case, “Everyone is looking because it’s dynamic and it’s fantastic.” Juleana adds that for this performance, “Marcel wants to be more stripped down.” Viewers can expect to see a side of Michelle-Mobama that they haven’t before. Recently added to the line-up is local spoken word poet Katie Robinson. Juleana and Garner expect this diverse cast of performers to help the audience engage with the show in new and different ways. Doors will open for the performance, which is 18-plus, at 7 p.m. The show will run until about 9 p.m., and will be followed with a DJ set by Soft Boundaries artist Dom Laba. Soft Boundaries is on view through May 18th. Gamut Gallery is open Thursday through Saturday, from 1 - 7 pm or by appointment.